We’ve all had it happen before: one day you’re lightly browsing through some article about hiking the Appalachian Trail, and the next your Facebook page is trying to get you to buy a pair of hiking boots that just so happened to be on sale at that very moment. But how is such a feat of mind-reading accomplished? How do major websites like Google, Facebook, or Twitter seem to already know what you want to buy before you go to buy it? It all works through a system known as “ad tracking”, a technique that’s as controversial as it is effective at getting people to click the buy button before they even know what hit them. But how does ad-tracking work exactly, and is there any way you can get yourself off the advertising radar completely? Read on in our guide to find out! How does ad tracking work? For decades, advertisers have been perfecting the art of getting the right ads delivered to the right demographic of people that most accurately fits the products and services they’re trying to sell. Whether this was through targeted ads in a newspaper (a sale at a sporting goods store would be in the Sports section, for example), or using Nielsen data to only show a specific TV commercial in a select city or region, the idea is to maximize the chances that an ad will find the right kind of customer at exactly the right time. This process was mostly hit-or-miss for most of the 20th Century and leaned a lot more on art than science. Then the internet opened a Pandora’s Box to ad agencies with the advent of practices like “online behavioral” advertising, which allowed them to accurately and relentlessly target their perfect customer every hour of the day. Sometimes referred to as “interest-based” advertising, this method of displaying ads relies on tracking cookies to build a rough profile of who’s using the computer, what types of content/products they’re interested in, and which domains they like to shop at the most. But how does it build this picture of you, and how much does it really know? Let’s say you’ve been checking out a couple YouTube videos on the “Top 10 Beginner’s Snowboarding Tips”, and might have looked at a snow jacket once or twice on Amazon without pressing the buy button. An online behavioral ad tracking system will have broad pieces of metadata about these browsing patterns stored on your local computer in what’s known as a “cookie”. A cookie is a snapshot of data that web browsers can use to see information like if you’ve visited a site before, what links you clicked on, or what ads you’ve already seen previously. Once the cookie is stored, any websites that utilize ad tracking networks (read: pretty much all of them that are free) will let the advertiser pull from that data to determine what kind of banner ads, sponsored content, or pop ups the reader should be shown. By applying rough metadata details like your age, gender, level of education or salary against the data of your browsing history, advertisers can form a semi-accurate idea of who’s using the computer and display whichever type of ad will have the greatest chance of getting you to click. As an example it’s likely that the ad networks tracking me know that I’m a male, aged somewhere between 25-34 who lives in Portland, Oregon and has an interest in privacy and technology. Beyond that the details probably get a lot more fuzzy, because it’s still illegal in the US for advertisers to collect or track any information that could be used to specifically identify me or anyone browsing from my device. Interest-based ad tracking isn’t inherently a bad thing, and much of the content that you read/watch on the web for free wouldn’t be able to stay that way if advertisers weren’t there to foot a part of the bill. Ad tracking is designed to help advertisers and content producers get the most out of their relationship, and when it’s working as intended it can be beneficial for all sides of the equation (reader/shopper included). When ad-tracking is at its best it can find you at just the right time with a great sale on say, a beginner-level snowboard, that’s at its lowest price right before you’re planning to hit the slopes. Making sure deals like that are in front of the right set of eyes at the right time is only possible through techniques like interest-based ad tracking. Where ad tracking starts to get a bit more bothersome, however, is just how the data pulled from the system is used, sold, and stored. Although none of the data gathered by advertisers should ever be enough to physically identify you or your family members, it can still be unnerving to some people to give over any of that information at all. Knowing that you’re being tracked in the first place is often enough to want to stop the practice cold in its tracks. Not only that, but when you get into the shadier bits of this marketing tactic where bundles of people’s profiles are bought and sold on the open advertising market, it becomes clear that just about anyone could in theory gain access to that metadata and siphon it off to less-than-reputable parties. It’s the not knowing exactly who is looking at that data or what it’s being used for that makes people the most uneasy about this whole thing, and rightfully so in our opinion. So, how can you prevent yourself from being tracked? By opting-out. As part of the agreement that advertisers have to stick to if they want to be allowed to even collect the rudimentary data they get in the first place, customers are allowed to submit an “opt-out” request from any device they choose. This means that once you’ve opted out, instead of a tracking cookie on your device which tells the advertisers what they need to know to display a targeted ad, they receive the opt-out cookie, which means you’ll be displayed a default ad which could apply to any demographic equally. For users who are privacy conscious and don’t mind losing the catered ad experience, opting out of the ad networks is the simplest way to cut the problem off at the stump. But with so many advertising networks, it would take forever to manually petition each one to take your specific browser or device out of the rotation. Luckily, there are several tools on the web that will opt you out of this advertising practice automatically for any device or browser you want to pull out from underneath their tracking claws. As we mentioned earlier, the only way advertisers were given permission to participate in interest-based advertising was to agree to let consumers opt-out of the relationship, and to make the process as simple and painless as possible. DAA Webchoices – The first website we recommend using is the Digital Advertising Alliance’s tool, because your best bet to opt-out in bulk is to hit the problem at its source. The DAA is an independent, non-profit organization led by the leading advertising and marketing trade associations, including the Association of National Advertisers, the American Association of Advertising Agencies, the Direct Marketing Association, and more. The DAA enforces the practices that dictate how online advertisers can or can’t behave, and is the primary resource for updates on what every major online ad network knows about you. To opt-out of these networks, simply click on the link above and the tool will automatically generate a list of every major online advertiser that has a cookie stored for the browser you’re currently using. Once the scan is complete you’ll see a full list of the ad networks operating online, as well as an indicator whether they have tracking cookies on that browser and a checkbox for opting out. The process should only take a few minutes to complete, and you’ll see a list of how many ad networks were opted out of after it’s done. Keep in mind that this tool needs to put an opt-out cookie on your local device in order to work, so be sure you haven’t disabled cookies altogether before you start the scan. Also remember that the DAA scan is unique to each browser and device you want to opt out with, so if you want to be sure that none of your devices are being tracked, you’ll need to run the scan on each platform/browser individually. That said, the DAA also offers a mobile app called AppChoices that you can install on any iOS, Android, or Amazon device which will automatically limit both how your mobile browsers collect data, as well as any apps installed on the device itself. Anti-tracking Browser Add-Ons – Ad blockers are browser extensions which don’t simply opt you out of being tracked for targeted advertising – they kill the ads altogether. In general these add-ons work by scanning pages as they load for any ad network content that’s cross-checked against their constantly-growing database of sites. If any traffic that appears to be from an advertiser, the ad blocker stops it in its tracks, preventing the ad from appearing and stopping the advertiser from placing a tracking cookie on your local device. This is the more blanket approach to stopping yourself from being tracked by identifying cookies, but will also yield benefits like increased pagespeed, decreased load on your browsing device, and a cleaner browsing experience overall. By this point Firefox or Chrome users may be scoffing at the idea of using any of the tools above, because like anyone who cares about their privacy, they’ve already got the “Do Not Track” box checked in their browser’s settings. The problem with Do Not Track, however, is that this request is largely ignored by ad networks because without any governments there to actually enforce it, ad networks have found numerous ways to slip right past. There have been dozens of appeals to the FTC over the years to create some form of regulatory body which could actually hold advertisers accountable for ignoring Do Not Track requests, and fine anyone who violated the terms accordingly. Unfortunately, all efforts on this front have been met with millions of lobbying dollars on the behalf of advertising agencies nationwide and were abruptly stopped in their tracks. It’s not all doom and gloom, though. The portal DoNotTrack.us is a website which lists all the advertising networks and internet companies who have pledged to honor any Do Not Track requests they receive. But, as good as it may seem, as you can tell that list isn’t really as long as we all know it should be. While opting out is the best way to put yourself on the proverbial “do not call” list for online advertisers who want to target you with specific offers, it doesn’t end advertising altogether. Sometimes websites will still keep ads relevant to their own content in the spot where your targeted ad would have been, which means that even though that next shoe ad may not have your exact size, it could still be enough to catch your eye and make the sale anyway. If you want to get rid of ads entirely you’ll have to employ any one of the many ad blockers that are available for web browsers and mobile devices, and lucky for you Comparitech has already done the heavy lifting to find out which ad blocker blocks better than the rest. Without question or competition, the two biggest domains on the web that benefit most from people not opting out of ad tracking are Google and Facebook. Each have built veritable empires off the information they’ve gathered/resold on their users, and have independently spawned hundreds of new advertising techniques that made them (and advertisers) more money than the GDP of most major Western democracies. But even with all their clout online, Google and Facebook still have to abide by the same rules as everyone else and provide a simple, easy to understand method of opting out for every user that has an account with their services attached. 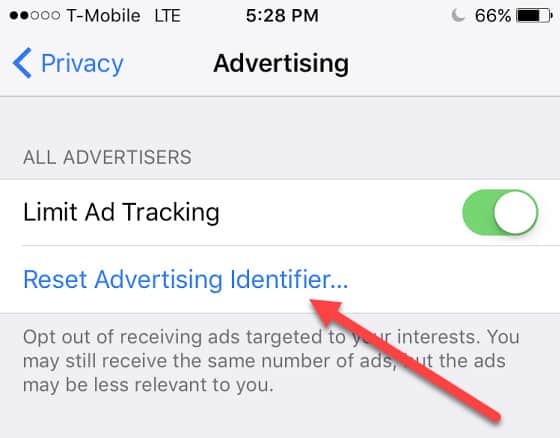 These opt-outs don’t prevent Google or Facebook from tracking your ad preferences, but rather stop the services from displaying you ads based on behavioral cookies that other advertisers have placed on your device. 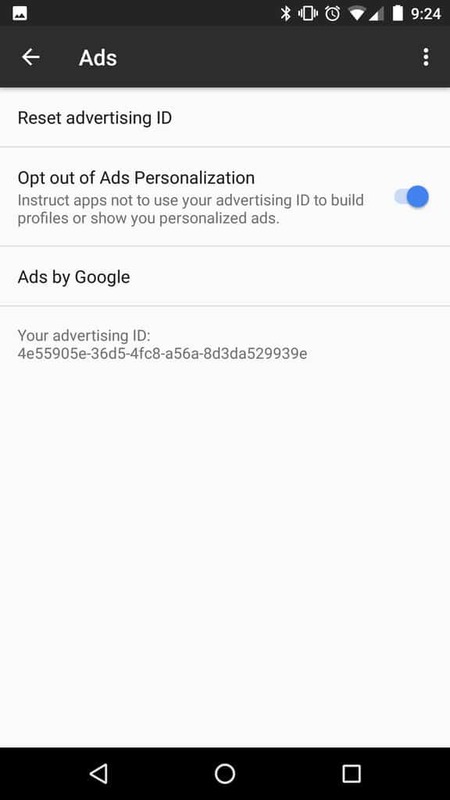 To opt out of ad-tracking on Google, start by accessing your account’s Ad Settings page by clicking the link here (and make sure you’re signed in first). Once this is toggled off Google will no longer show ads that are relevant to your interests on Google searches or through any of the advertisers that use the company’s platform to display ads on partnering websites. 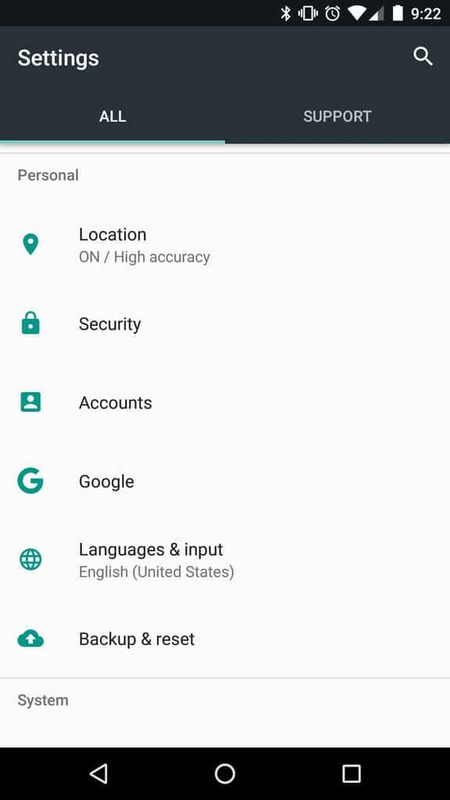 You should also be sure to uncheck the box labeled Also use Google Account activity and information to personalize ads and apps and store that data in your Google Account. This unties all personally identifying information that partnering advertisers might have gathered on you through your Google App usage (Gmail, Drive, Photos, etc) from your account, and prevents those associations from being made in the future. Finally, just below these two options Google will actually show you all the information they’ve gathered on your ad preferences since the start of you using that particular account. This might give you a bit more peace of mind regarding just how deep the well of Google’s data on you goes, but it could prove to be equally unsettling if any of the topics are a bit too on the nose. For any subjects that you feel might be too personal or you just want to remove because they’re not relevant, you can go through and click the small X on each topic to take it off Google’s list. 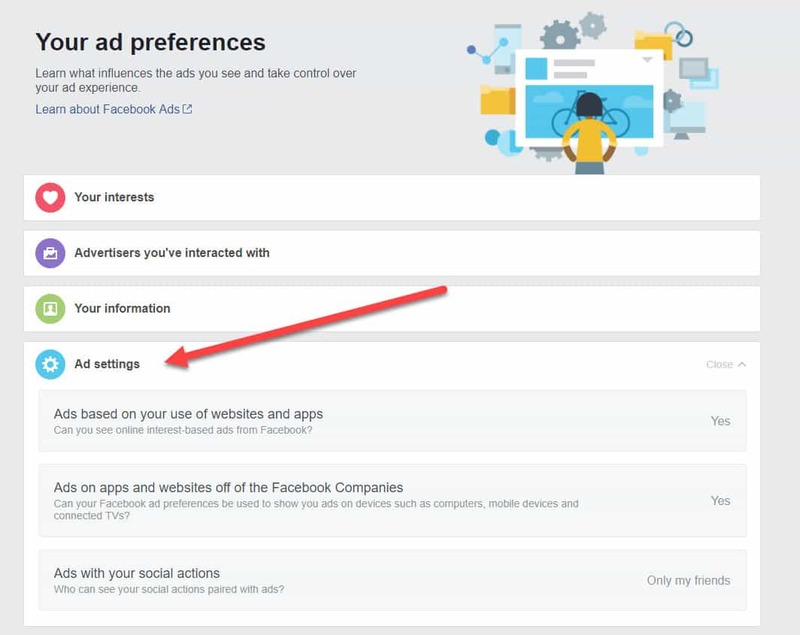 To opt-out of having interest-based ads displayed to you on Facebook, start by visiting your Ad Preferences page by clicking the link here. You can click this to see what data Facebook is using to show you ads, as well as change your preferences of where Facebook is allowed to display ads to you and how your social actions (likes etc) help Facebook show ads to those on your friends list. Once all three of these settings are turned off, Facebook will no longer be allowed to use any interest-based cookies to display you ads on their services. iOS 11 users on the other hand don’t have to lift (or tap) a finger to stop ad-tracking in their Safari browser. With the release of their latest mobile OS update, Apple has natively included a set of commands in the Safari browser that prevent it from building up a stash of tracking cookies for longer than 30 days at a time. Once you flip this on your phone will no longer allow advertisers to use data from your device to find more interest-based advertising. 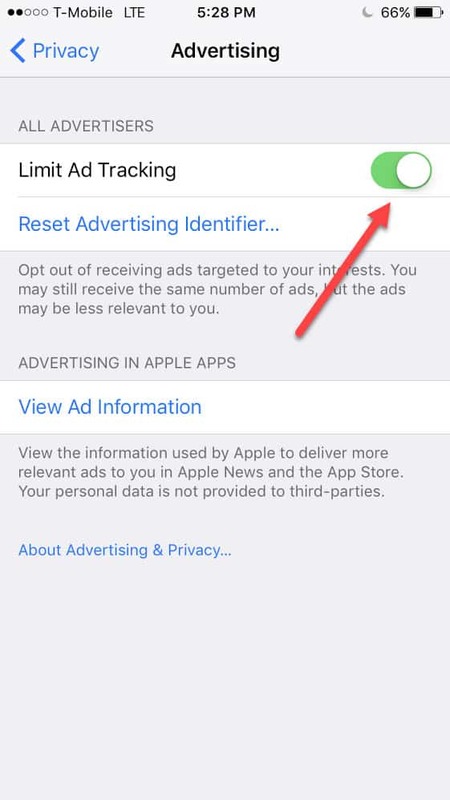 Finally, to delete any behavioral cookies stored on your device from before the toggle was activated simply tap on the link labeled Reset advertising ID to wipe any identifying information. Microsoft has been on a lot of privacy advocate’s bad sides since the release of Windows 10, which is inarguably the most personally invasive operating system the company has released to date. 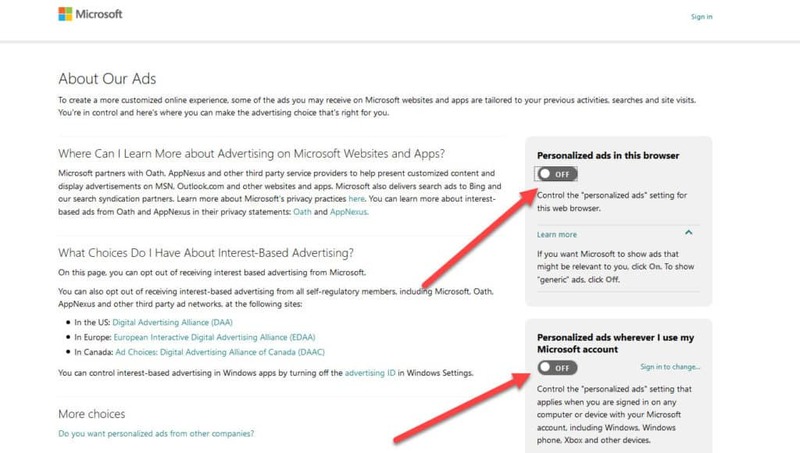 One of those privacy-invading features is the advertising ID that Microsoft gives to advertisers that doesn’t just track the websites you visit through the Edge browser, but also tracks how you use certain Windows apps too. 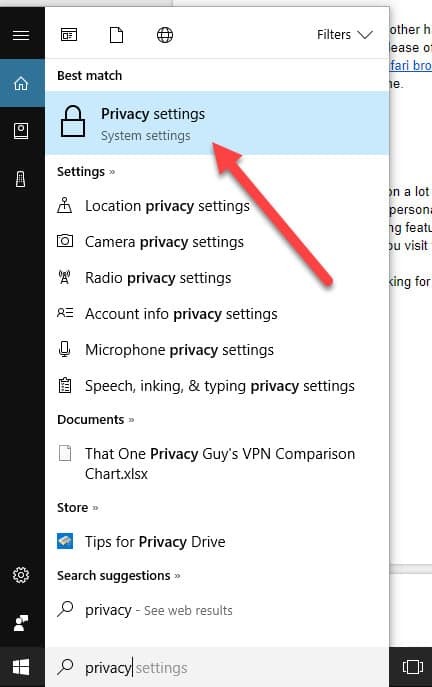 This will make it so your operating system will no longer allow advertisers to collect data on how you use the Edge browser or any of the official Windows 10 apps. Finally, we also recommend visiting the Microsoft Choice page, which not only lets you control what information Microsoft collects on you while you’re using that specific browser, but will also prevent interest-based advertising on any devices that are tied to your Microsoft account, including your Xbox or Windows Phone. Opting out of ad networks is a great way to guarantee that your favorite web browser or mobile device won’t be freely handing out information on you or your family to the highest bidder. Whether you’re someone who’s concerned about the level of privacy erosion that’s been steadily growing over the past few years or just don’t want advertisers knowing where you’re planning your next vacation, opting-out of large ad networks through the DAA and locally on your device are two of the most reliable ways to head the issue off before it snowballs out of control.